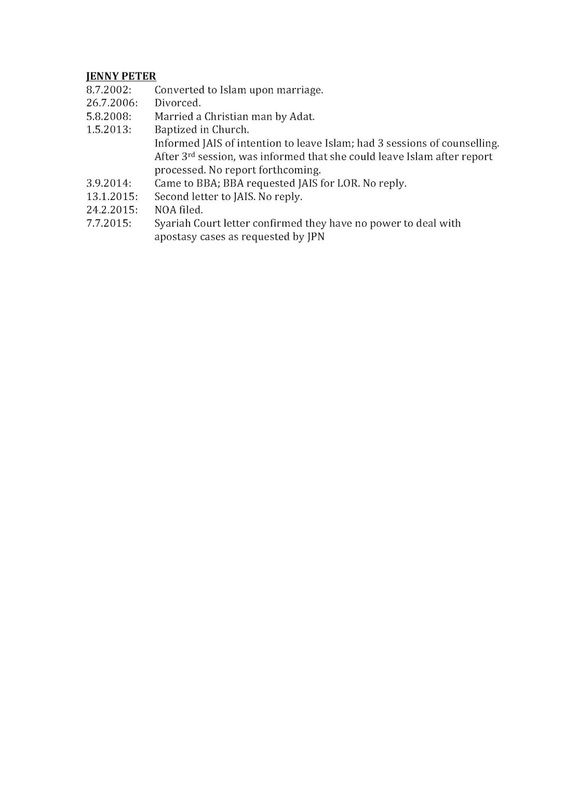 The kneejerk reaction of some members of the Muslim community in hurling insults and abuse at me, and even calling for my death, after the Federal Court decision yesterday clearly shows that they do not know the background of the cases and how the legal trials and tribulations of the 4 individuals has come to this. I was out of town attending another case when the decision was delivered, and upon my return last night, I was saddened and shocked to see the videos and postings, and the statement by a PAS Central Committee member* against me. Firstly, I categorically refute the allegations that I am ‘Christianising’ Muslims or making Muslims ‘murtad’. These 4 persons only came to see me when they had run out of options in negotiating their release from Islam, and by the time I met them, they had long ceased to be practising Muslims. So to accuse me of making them ‘murtad’ is a vicious slander, and I am disappointed that those who profess to practise their religious faith should make these false accusations against me. Nevertheless, my own religious conviction compels me to forgive and love them, for they do not know what they are doing. It is the system that has failed these individuals. They had done everything that they were asked to do, and yet, the release they wanted was never given. 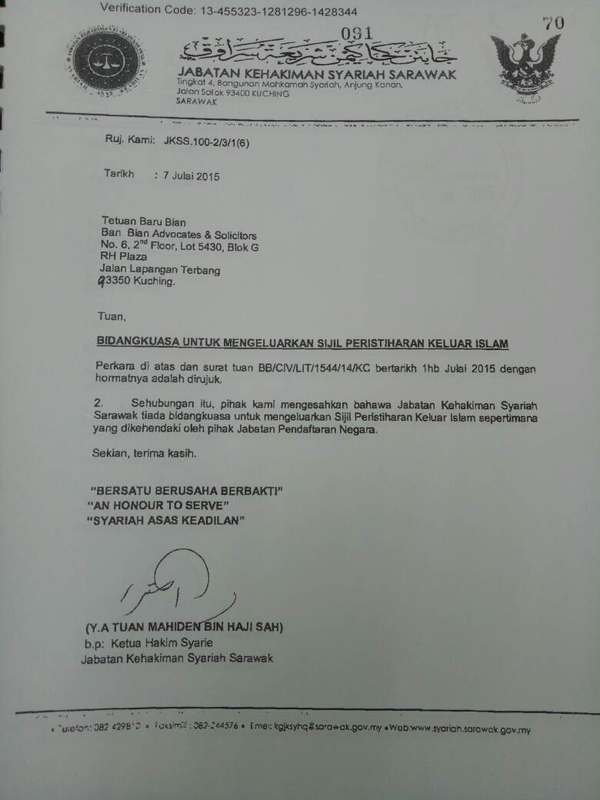 Their letters to JAIS were ignored. In one case, letters to the JPN and the CM’s office also met with no response. 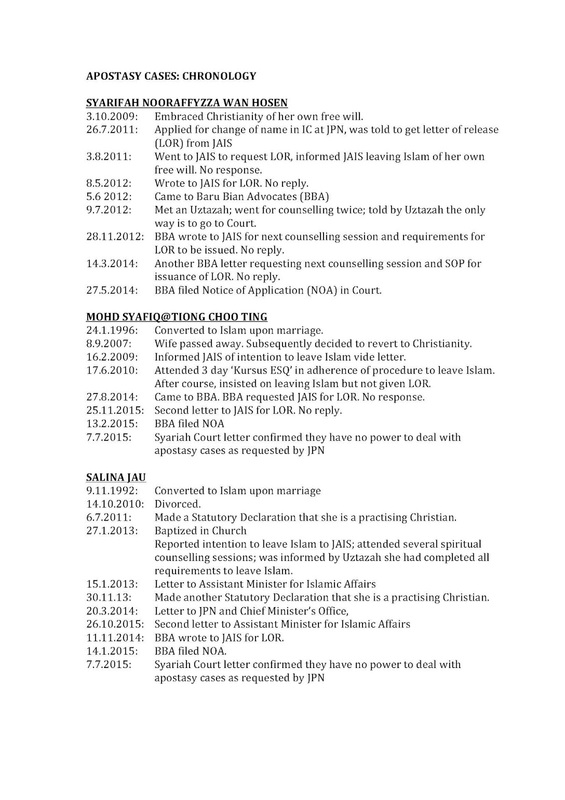 The details of each case differ (see attachment for case chronologies) but I only took up these cases after the applicants had hit the proverbial brick wall. After taking on the cases, my legal firm had been informed that the Jabatan Pendaftaran Negara (JPN) required a letter of release from the Syariah Court in order for them to amend the applicants’ identity cards and particulars in their system. 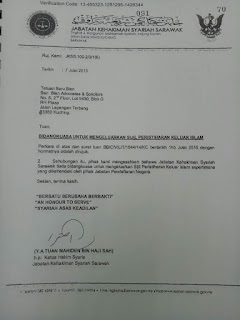 However, when we inquired from and/or applied for such letters from the Syariah Court, we received a letter from the court to say that they had no power to issue such letters of release under the Syariah Court Ordinance Sarawak 2001. Hence the legal proceedings had to be filed in the civil High Court for its opinion. Contrary to the Syariah Court’s letter, lawyers for Jabatan Agama Islam Sarawak (JAIS), Majlis Agama Islam Sarawak (MAIS) and the JPN argued that the Syariah Court has the implied power to deal with apostasy. As the law is not clear on the matter the issue had to be brought all the way to the Federal Court which finally made its decision yesterday morning that the Syariah Court has the jurisdiction to hear apostasy cases. The legal issue is now settled. Because I believe, and many believe, in the Rule of Law and that the Federal Constitution is the supreme law of this country (Article 4 of the Federal Constitution) on which our Courts had been established, we accept the final verdict of the Federal Court. On reflection of this matter, I see a parallel with my advocacy for the native customary rights of the indigenous people. In the early days of NCR cases, very few lawyers were willing to take on land cases for fear of being called ‘anti-government’ or because of vested interests. In the same way, few lawyers were willing to take on conversion cases for fear of being branded as ‘menghina Islam’ or ‘anti-government’, or simply because they did not want to have to come up against all the red-tape and obstacles facing these applicants. In NCR cases, we do not discriminate against people of any races or religions. We do not pick and choose, but we represent those who seek justice from the state. Will these accusers acknowledge that I have acted for Muslims in many cases in claiming their native lands and in particular the cases of Hj Rambli Bin Kawi, Abu Bakar Pangis representing 150 families and Karim Bin Enur representing more than 90 families and won? In the NCR cases, the issue of the recognition of Pemakai Menoa and Pulau Galau has been decided by the Federal Court in TR Sandah. Whether I agree with the decision or not is irrelevant – the decision allows us to move forward, and even the Government acknowledges that it may be necessary to amend the law to protect the rights of the people. It is the same in these conversion cases. The problem arose because the Syariah Ordinance is silent on its jurisdiction to decide on apostasy matters, and the Syariah Court had declined jurisdiction. This lacuna in the law and the long-drawn process had caused the applicants much anguish, anxiety and frustration. The decision of the Federal Court allows us to move forward and the legislature should consider whether the Ordinance should be amended to make the law clear. People who genuinely wish to convert should not be ignored and left in limbo by the institutions of the state. Those who accuse me of having a Christian agenda by representing these 4 individuals free-of-charge are blatant liars. I have been representing them in my professional capacity as a lawyer and they have paid my professional fees and court fees. Those who make up lies about me clearly have political motives or have deep-seated insecurity about their own religious convictions. If I had any Christian agenda, then the authorities should have taken action against me. And if these converts were wrong to convert out of Islam, then JAIS or MAIS or the Syariah Court should have charged them when they informed them of their intention to leave Islam or when they were called for counselling. The Federal Constitution guarantees these 4 persons their freedom of religion. Who are the State and her institutions to deny them these rights? Why are my accusers so twisted that they do not realize that in speaking up for these 4 individuals, I am upholding the right of every Malaysian to practise the religion of his or her choosing? It is indeed tragic that some segments of Malaysian society have regressed so much that they do not exercise independent thought and are so blinded by racial and religious bigotry that they do not see the wood for the trees. In Sarawak, freedom of religion and the absence of an official religion were fiercely defended by our forefathers. This has allowed us to live in religious and racial harmony for many years. I will continue to defend these rights as long as I am able to, without fear or favour, both as an advocate and as a representative of the people, mindful always of the responsibilities imposed on me in both roles to preserve, protect and defend the Sarawak Constitution and the Federal Constitution. It has been heartening that many people from both religions have closed ranks to stand up to the threats and abuse hurled against Christians and me. I wish to thank them for the very rational and reasonable stands made by them, including my colleagues in PKR Sarawak. I believe it is time for many others to join in this chorus calling for acceptance and peace. When true leaders speak, their followers will obey and listen. Such is the time for all leaders from the religious divide to speak and stand together in order to protect and preserve our multi-racial and multi-religious Sarawak, and be vigilant to repel negative influences from beyond our shores. * the earlier reference to PAS Youth was incorrect. ~ admin. 10 February 2018 marks three years that Anwar Ibrahim has spent in jail for the second time. Throughout the country, KEADILAN is simultaneously launching the Bebas Anwar Countdown this evening to commence mark the remaining days for which Anwar Ibrahim will be deprived of his freedom by an unjust system and institutions that are tainted by unprincipled individuals. As declared by the United Nations, Amnesty International and Human Rights Watch, Anwar Ibrahim is a prisoner of conscience. His imprisonment was purely for the political purposes of the desperate and shameless UMNO/BN government. Rather than taking up offers of asylum in foreign countries, Anwar Ibrahim was prepared to sacrifice 5 years of his life to stand by his principles and for democracy. 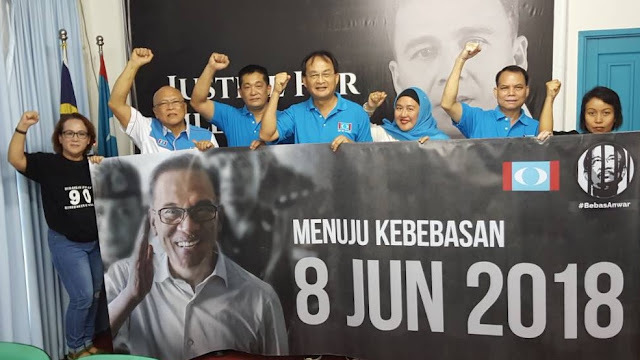 The term in prison has not only robbed his family of the presence of a husband, father and grandfather, but it has also cost Anwar Ibrahim much in terms of his health. Yet through it all, he has remained calm and positive, and not allowed himself to become bitter and unforgiving. Exhibiting the traits of a true leader, he has welcomed his former adversaries from UMNO into the opposition coalition to forge a stronger force against corruption and kleptocracy in Malaysia. We look forward to the day of Anwar Ibrahim’s release, and call upon all Malaysians to support Pakatan Harapan in GE14 so that injustices done to prisoners of conscience such as Anwar will never be repeated in this country. We must make all effort to bring forth a new chapter in Malaysian history and start the rebuilding process so that our country may one day be a beacon of truth and justice that we can be proud to call our home again. Today the Sarawak Dewan Undangan Negeri, or the General Council or the Council Negeri as it was known in the early days celebrated its 150th anniversary. I believe that it is recognised as the oldest DUN in Malaysia, and this adds even more meaning to this celebration. One of the unique features of our DUN, and one that I am most proud of, is the fact that any of the ethnic languages in Sarawak is allowed to be spoken during the proceedings. This is a reflection of the Sarawak of our forefathers, in which the diverse ethnicity and background of the various communities were widely accepted and respected. No one community was considered to be superior to the rest, and all were treated as equals. I am aware that some quarters hold the view that the White Rajahs and the British administration were oppressive exploiters of Sarawak and her people. However, it cannot be denied that they put in place a highly efficient and respected civil service and a superior educational system that again did not emphasise the superiority of or the preference for, any particular race or ethnic group. Also, the documents left behind point to an administration that was committed to good governance, justice and fairness. The guiding principles of the Brookes were set out in the nine ‘Cardinal Principles Of The Rule Of The English Rajahs’, and were eventually to become the preamble to the Sarawak Constitution. These principles are timeless and applicable even in this day and age. It is my hope that the members of this August House will continue to be guided by the ideals carried in these 9 principles. 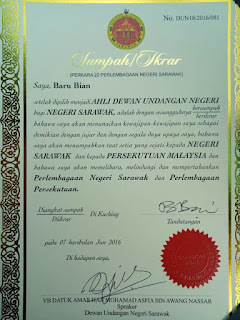 Today, our celebration of the 150th anniversary of the Sarawak Legislative Assembly is clouded by a prominent and pressing issue, that is the status of the native customary rights of the people over their customary land It is therefore timely to revisit our history in the context of the rights of the people and how these rights were viewed by the government of the time. It was also noted that there was a ‘Native Mohammedan Probate and Divorce Court’ and that although there was no equivalent court for either Chinese or Ibans, the customary law of both was recognized, as interpreted by Native Officers and community headmen, subject to the Resident’s discretion. In this context, the recent Federal Court’s decision in TR Sandah, which ruled that a custom or adat of the people must be codified for it “to have the force of law”, was shocking and unacceptable to the native communities in Sarawak. True to the prediction of AJN Richards, the NCR of the people are perishing, left in the hands of administrators, legal draftsmen, civil servants and judges who do not understand the customary laws of the people. Even some elected representatives from within and outside this august house have failed our own communities by not defending these rights when the need arose, whether for reasons of personal vested interests and/or political expediency or pure ignorance of these fundamental issues. In our quest for greater development for the state of Sarawak, such customary rights over land had been trampled upon or ignored by the powers that be, creating unnecessary conflicts and tensions, which have resulted in many injuries and even death. A case in point is the death of Bill Kayong. He died because he dared to speak up for the people. Even in death, he has not been accorded any justice. And today the Rajah’s greatest fears are realized. The prophecy of the betrayal of the trusting people has come to pass. While the people slept, the thieves came softly in the night and took our lands, casting us aside. This DUN may have many ‘achievements’ attained over the years; today ministers and elected representatives are congratulating one another while we sit in this vastly overpaid building. However, we must not conveniently forget that we are still far behind our Federation partner Malaya in development. For example, over 80% of our schools are classified as dilapidated while over 30% are critically dilapidated. There is a lack of proper infrastructure, especially road infrastructure. More than 50 years after we formed the federation of Malaysia, the road connectivity in the smaller divisions and rural areas still leaves much to be desired. In Ba’ Kelalan for example, the roads are so badly built that they hardly last a year and turn into soggy mud tracks when it rains. Last week, to attend a Native Court hearing in Kapit, I had to catch a boat from Sibu because the road has not yet been built. There are not enough hospitals and clinics, especially in the rural areas. At the General hospitals, you will see families of patients from the rural areas camped out in the corridors because they have no place to stay. Many of the rural clinics do not have qualified medical personnel to staff them. Even at the hospitals in towns and cities, there is a lack of medical specialists. Many villages in the rural areas still depend on generators for electricity. This is especially ironic because we have dams that produce more energy than we need, yet many of our people are not connected to the grid for power. As at the end of 2016, 30% of rural villages still had no access to 24-hour electricity supply. This figure translates to 40,000 homes of 250,000 people, according to a report by Sarawak Energy. As at March last year only 61% of rural Sarawak had access to treated water, while the remaining 39% representing 114,000 households have to depend on other sources for water. Sadly, we are not much different from when we first began. 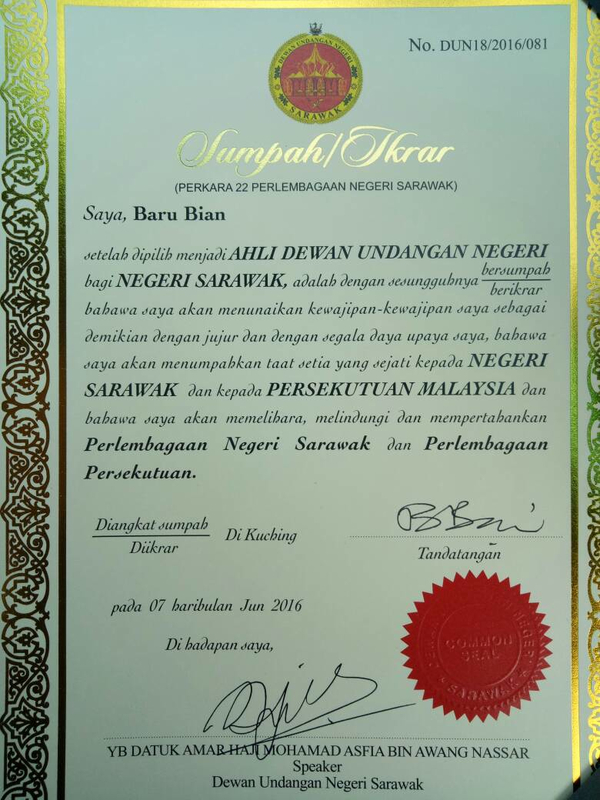 The members of this DUN have the moral responsibility to right a wrong done to the people of Sarawak. Let us mark this 150th anniversary by reflecting on the past, because as someone said, “life can only be understood backwards, but it must be lived forwards”. I want to believe that all of us who are sitting in this august house want the best for our beloved State of Sarawak and her people although we come from diverse political backgrounds. On such an auspicious occasion I wish to say on behalf of my other colleagues from the Opposition to pledge to do our best as per our oath of office to speak for and defend the rights of all Malaysians under the Federal and State Constitutions notwithstanding their colour or creed. On a personal note, I look forward to the amendment of the Sarawak Land Code to recognise and respect the rights of the indigenous people of Sarawak to their customary rights land, which is their life and their livelihood. This will be an achievement, which the Dewan Undangan Negeri can truly be proud of. This will be an act, which will honour our forefathers and what they stood for. Lastly it is a great disappointment that the present state Government did not consider it appropriate to allocate time for the opposition members to speak on such an auspicious occasion, which is a celebration of all Members and the people of Sarawak. 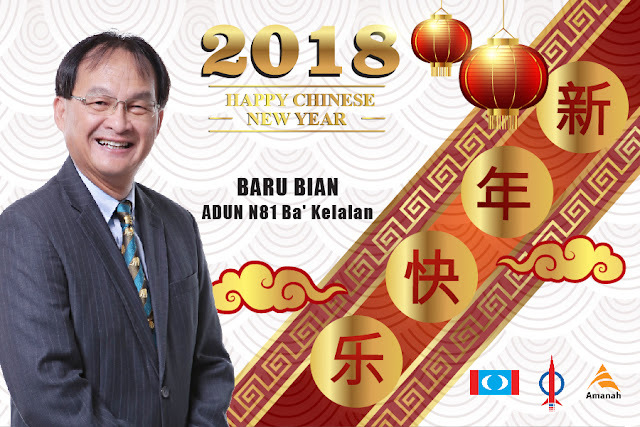 It is an irony when we say that we are celebrating our 150th anniversary of the DUN and as the oldest in the country, yet the BN Government is too immature to allow 'free speech' for members of this August House. I look forward to the day when we can truly say that we are a government of the people, for the people and by the people.